Begin by cleansing and purifying yourself with a ritual bath, allow all baneful energies to wash away into the water. Sprinkle a SMALL amount of baking soda or natural sea salt over the area to be harvested. The Egyptians used natron (a natural salt) but it's hard to get so we're substituting here. Fumigate the harvest area by burning pine resin and circling sun-wise three times. Light a stick or cone of Kyphi incense, say a prayer and pour a libation of milk upon the ground. 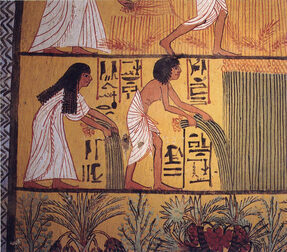 As you pull up the plant to be harvested, say aloud the name of the Deity to whom the herb is to be dedicated. Request assistance with the purpose of your spell. Roll the plant in a pure white linen cloth. Combine 7 wheat seeds and 7 barley seeds in some honey. Insert into the hole left by uprooting the plant, then fill it with dirt.